Eighteen year old Pride is a tracker with a hunger for blood. Taught to trick and to lure, she is the perfect killing machine. Source: I received an e-copy of this book from the publisher in exchange for an honest review. This does not affect my opinion on the book; it's my true opinion only. From Bloomsbury Spark - a new division of Bloomsbury - comes a new story by Cat Kalen. This is a story about trackers and hybrids. I haven't read a lot of books about these sort of creatures, so I found it to be quite different. Pride is kept along with others like her to be tested by her "master". When first reading about this, I wanted to know how Pride got there. One day, Pride ends up escaping from the compound, and this is where she finds another tracker just like herself. Logan is his name. He is mysterious as well as being protective towards Pride. I honestly had doubts about Logan at the beginning, but I grew to like him. Pride is feisty. She stands her ground and goes by what she says. She longs for freedom, and when she finally is free, you can tell she feels better, but at the same time is scared to be caught by her master. The attraction between both of these people is obvious, and I really did want them to get together. Every time they got close, they would pull away, and I would shout out "NOOO!!" There is definitely romantic tension between them. They are like magnets: if one is hurt or in trouble, the other will dive in and help them out. For a first book in a new series, I am excited to see what happens next. The book ended in such a cliff hanger that I just NEED to know! Kalen has developed her characters well. There is a lot of running around in this book. The story is written from Pride's perspective, so we get to see everything from her vision. There is also a decent chapter length. I did like to story. In my opinion, I did think there was a little but too much running around and hiding. The writing was good and easy to understand. Things were also explained really well in the begnning. 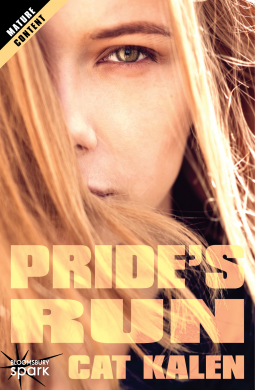 Pride's Run is a tale of freedom, love and friendship; with two characters that can't help but be a part of each other's survival. Overall I gave this book four stars. I can't wait to see what happens in the next book!